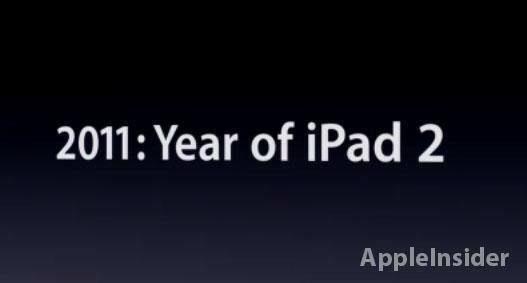 Apple has grounded speculation of a fall release of "iPad 3," focusing its marketing message on the iPad 2 it will soon offer for sale by calling 2011 "the year of iPad 2." Apple's chief executive Steve Jobs noted at today's event that 2010 was "Year of the iPad," and alluded to talk that suggests the company will face competition from an avalanche of competitors, including Google's Android 3.0 on the Motorola Xoom and Samsung Galaxy Tab, HP's webOS tablet, and BlackBerry's new QNX PlayBook, by rhetorically asking if 2011 would be the year of iPad copycats. "If we did nothing, maybe a little bit... probably not," Jobs said. "But we haven't been resting on our laurels. 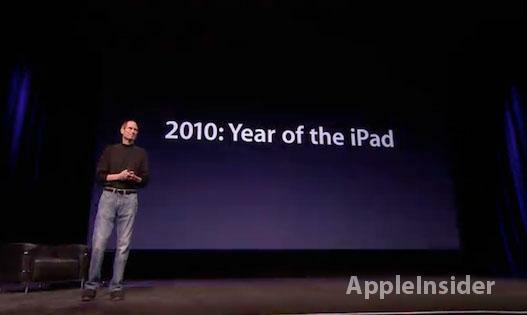 Today we're going to introduce iPad 2." After detailing iPad 2's features and price, which Jobs pointed out to still be substantially cheaper than the entry level tablet being offered at $799 (another allusion to Motorola's Xoom), Jobs added, "when you add this together with over 65,000 apps, we think 2011 is going to be the year of iPad 2." Jobs wouldn't have said that were he planning to introduce another iPad model this summer, indicating that speculation initiated by John Gruber's Daring Fireball blog that Apple might deliver a third generation iPad before the end of the year is not in the works. Nearly a month ago, Gruber wrote, "I think the iPad fits most naturally into the same schedule as the iPods: where new hardware is announced and ships in September. The iPad was a massive hit during this past holiday season. I dont think April is a particularly good month for an annual iPad release." He added, "My gut feeling is that Apple will move the iPad to a September release schedule, alongside the iPods. But they wouldnt want to wait over a year and a half from the announcement of the original iPad to announce the second one  not with these stakes, and not with so many serious competitors trying their best to catch up." He predicted Apple would release iPad 2 in March for an April release, then ship iPad 3 in September alongside the new iPod touch, suggesting that it could be "iPad 2.5" or "iPad HD," using the double-resolution 2048×1536 screen that evidence has pointed toward being part of the next iPad. A variety of other industry writers subsequently echoed the same idea. MG Siegler of TechCrunch wrote, "we've now heard that this 'fall surprise' is related to this would-be iPad 3. We don't have any more concrete information beyond that. 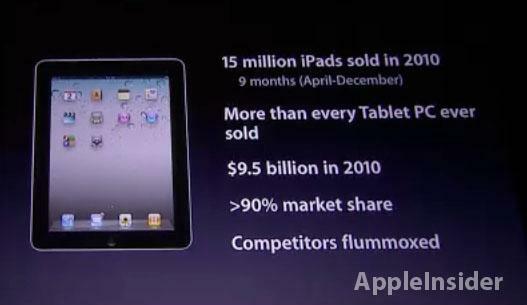 But, as of right now, the plan is apparently to release one iteration of the iPad in the next few weeks. And then blow the doors open with another new version in the fall." Jim Dalrymple of The Loop described Apple's possible iPad strategy as being like the iPod nano, writing "Remember the iPod mini? It was Apples most successful iPod outselling all other models of its time. 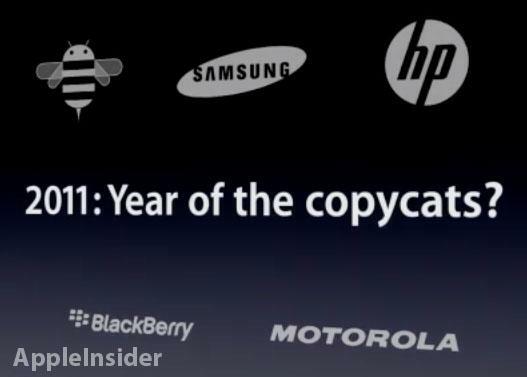 And Apple discontinued it. Just as the competition could say, 'we have a music player just like the iPod mini,' Apple canceled it and started over, releasing the iPod nano. This threw the competition into a tailspin. I wouldnt be surprised to see Apple do it again, this time with the iPad." Based on checks with Ming-Chi Kuo of Concord Securities, AppleInsider reported that iPad 3 does appear to be targeted for a higher 2048x1536 resolution, but that its release would likely be further out rather than being a September release. 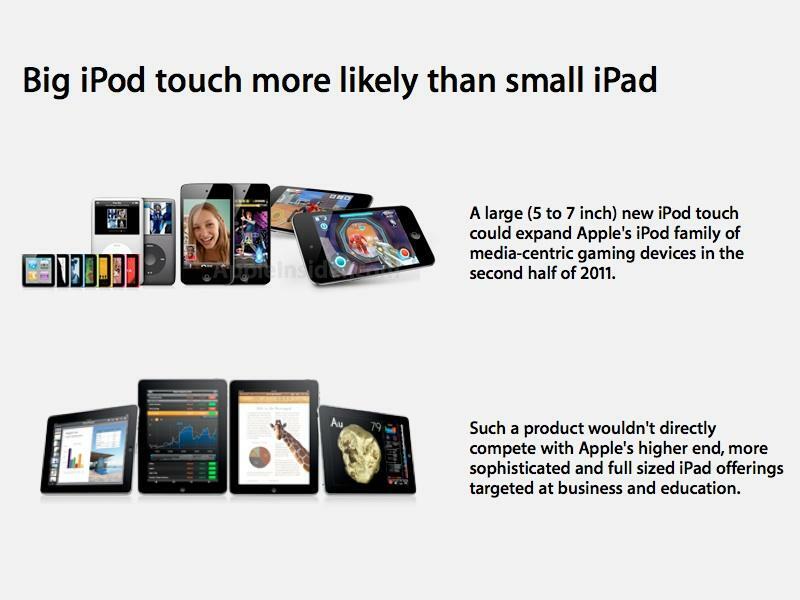 In the interim however, Apple is thought to be working on a device that is not an iPad, but rather sized between it and the iPod touch. Other rumors have supported the potential for a new iOS device with a screen between 5 and 7 inches (roughly 12 to 18 cm), but this is unlikely to be a scaled down iPad for the same reasons Jobs criticized iPad competitors trying to release 7 inch tablets last fall. Jobs' prediction that small tablets would not be popular and would subsequently be replaced by competitors' iPad-sized models this year, leaving their early adopters stranded without any upgrade potential, has been proven true by the failure of devices like the Dell Streak and Samsung Galaxy Tab. Both companies are now talking about 10" tablets, although they are, like Motorola, finding it difficult to match Apple's prices. It is possible that Apple could release an oversized iPod touch, likely aimed at gaming and young users, this fall as part of its iPod event. However, it appears clear that Apple won't be releasing multiple iPad editions through the rest of 2011, leaving customers focused on the new iPad 2.